Have you ever thought about how much money you actually spend on food? I’ve always been aware, but I recently decided I want to get a better grip on my groceries. As I like to eat Keto style combined with intermittent fasting, I tend to spend more on food. I’ve also been a bit lazy, buying pre-prepped items wrapped in a lot of unnecessary plastic. Last but not least, I wanted to see how much money I can save. 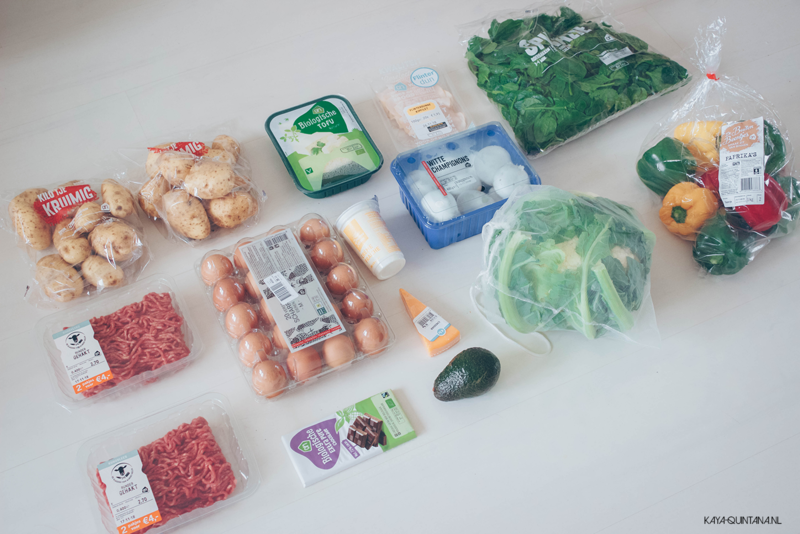 How much I can reduce my waste and show you that eating healthy doesn’t have to be expensive. And so my healthy food on a budget challenge was born, haha! 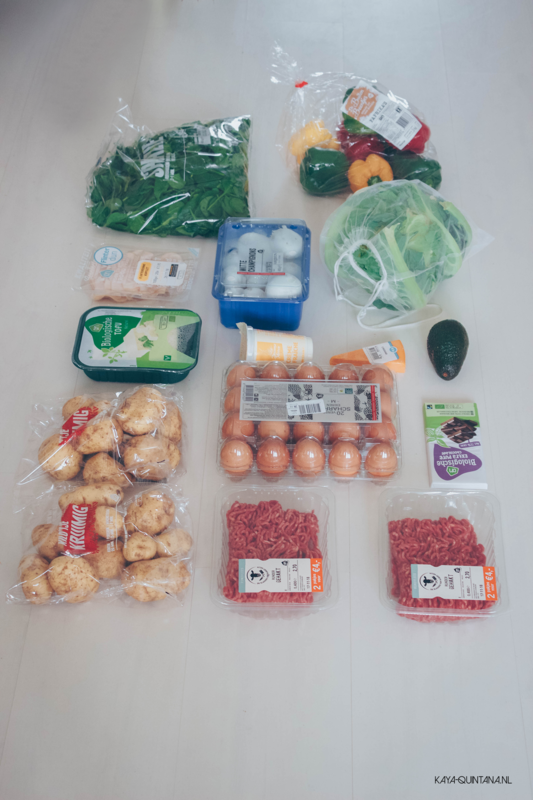 In this article and matching video, I’m showing you how I spend €25 for seven days of food. You can of course use any currency you like and set the challenge to match the area you live in. 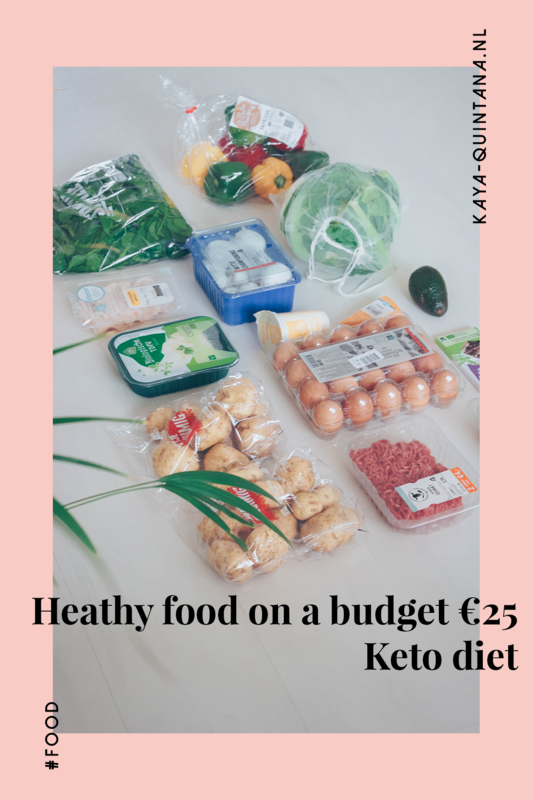 I personally spend about €40 a week when I’m not on a budget. Check one of my Keto grocery lists here. I tend to buy high-end products and also a bit too much. I usually have trouble eating everything I buy and some of it ends up in the trashcan, such a waste! I figured that €25 would be the perfect amount of money to make me pay attention to what I’m buying. About €15 less than usual, a real challenge! I want to give you a bit of context for this healthy food on a budget challenge. I eat Keto style combined with intermittent fasting. This means I have two big meals and a few snacks per day. I also eat a lot of vegetables mixed with meat and fish. These things tend to cost a bit more than prepackaged food, so I had to be smart with my money. I took an hour on Sunday night to setup my grocery list before I went to the store on Monday. I also made a menu filled with things I wanted to eat, which made me very creative, haha! These five rules helped me create the following menu, I was going to try and stick to. I didn’t add the snacks yet, because it always depends on the day what I’m craving. And I wasn’t going to mess with my snacks. I mean snacks are mandatory, haha! This menu wasn’t set in stone, because I wasn’t completely satisfied. Neither do I know what I feel like eating a week in advance, but having some sort of menu in place does help with eating healthy food on a budget. 1. Omelette with three eggs, half an avocado, shredded cheese and thinly sliced chicken breast. You can watch my healthy food on a budget video for the grocery list. But I also wanted to give you a budget breakdown, because that is the most fun part to me. I looked up all the groceries online and calculated all the prices. I made sure I was going to stay under €25 for the entire week but ended up a few cents higher due to price changes in the store. I was so pissed, haha! That’s just what can happen, grocery stores adjust their prices every day. I still think I did pretty well with my budget grocery list, check it out! This is my complete healthy food on a budget break down. I hope it gives you some inspiration to try it too. I have to say it made me really aware of where I was spending my money on. I also managed to buy more products for less money. This also proofs it’s doable to eat healthy on a budget, even for someone on the Keto diet or intermittent fasting. I guess you’re also wondering if I managed to implement my planned menu. Well, I also made a What I eat in week video, which will be up next week on the 28th of November. Check back for a new What I eat in a week video and don’t forget to tell me if you liked this one. Because I would like to make more of these videos, it was so much fun! P.S. Subscribe to my Youtube channel for more food videos and tips. Did you like this article? Great, you can buy me a drink to support my work. Thanks in advance!